That old costume jewelry could be worth money! What will your old costume jewelry sell for? Costume Jewelry isn’t always a big seller, but popular brand names and sought-after materials can push sale prices up! 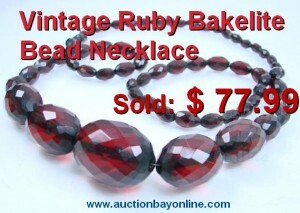 Such was the case with this vintage faceted red bakelite bead necklace! Bakelite, a predecessor of modern plastics, is a desirable material, and can mean the difference between a non-seller and a big seller like this one. This strand of beads offers a classic look and is in great condition, helping it sell for $77.99! Among the most desirable of costume jewelry are matched sets (earrings with pin or brooch, necklace, all in the same style). One of the names we look for is Trifari, whose elaborate pieces can be worth a fair bundle, if their condition and appearance have been maintained. Sometimes, an entire jewelry box of costume pieces can sell en masse for a fair price, too! At Auction Bay, we’ll help you find the hidden treasures in your collection. Once, we found a rare gold coin in our consignor’s old jewelry box, long forgotten and ready to sell. She was quite happy with the result!